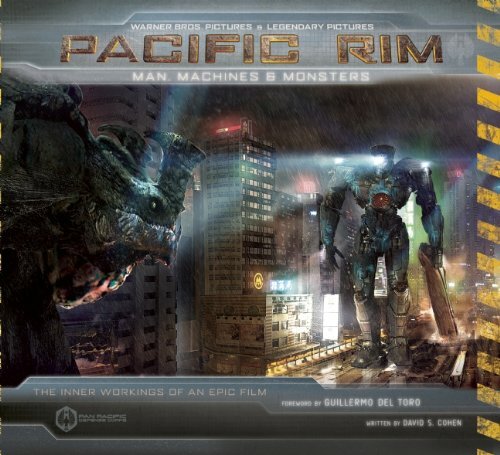 Pacific Rim: Man, Machines, and Monsters is the art-and-making-of book for the film. It's a great book. Big, hardcover, 156-pages. There are additional sticked on materials on the pages, stickers and two big posters. The book is packed with amazing content. There are lots of concept art, set photography and lengthy writeup on the production. Everything's beautifully laid out. The concept art consist of the characters, Jaeger robots, Kaiju monsters and film scenes. The bulk of the art, more than half the book, is on the Jaegers and Kaijus. The development art are just awesome. They are very detailed. There are Jaegers with their front and back with closeups to their heads, battle damaged versions, 3D wireframes, 3D gray models and some discarded concepts. Kaijus are crustacean-lizards-insect inspired. The designs look great, menacing, and dangerous. The texture work is really well done. The sculpted maquettes look terrific. There are twelve Kaijus if I counted correctly. Guillermo Del Toro has his unique sense of art direction. It's clear he likes monsters very much. Kudos to Hugo Martin, Alex Jaeger, Francisco Ruiz Velasco and other artists on the designs also. The set designs are illustrated with mainly photographs and art. Again, they are very detailed and there's a strong sense of worn and tattered feel to most places. The commentary is excellent. There's plenty to read about the characters, the designs of the Jaegers and Kaijus, and many stories on the production process. This is a fantastic art and companion book to the movie. One of my 2013 favorites. There are two publishers for the book, Insight Editions and Titan Books. Those in USA should get the one from Insight Editions. So when it comes to the book having two publishers - I know Titan Books usually handle UK editions of most things - is the book going to be exactly the same from both publishers, just with a different publisher's logo? Is there any differences between the 2 editions? Cause on Book Depository they say 160 pages for the Titan Books edition and 156 pages for the Insight Edition? Thanks for the review, I'm really interested! They should be the same regardless of publisher. Ok! Thank you for your answer! I will buy it right away ! I'm a fan of Evangelion and the movie is clearly "inspired" from it ! Actually, other than the premise of big robots fighting big monsters, it's quite different from Evangelion, well at least in terms of art direction. Ah ok! I will see that as soon as I receive my copy. Oh! You remove the pictures of the book? Why that? They are the reason why I decided to purchase it! It's strange because your review isn't after the Tomb Raider artbook's review when I visit your blog. I can access this page only when I use the link on the mail I receive from your answer to my post. And the pictures aren't visible. I don't know If this is only for me?! I'm putting the pictures back on June 18. Ah.....ok! I'm a little slow !!! Maybe Titan is an english publisher and Chronicle Books is an american one? Is this the difference between the 2 artbooks? I trust your judgement, Parka, and so I just ordered a copy of "Pacific Rim: ..." via a link from your website. I am looking forward to see your photos and to receive the book soon. Very interesting that some vehicles in the movie have German names (Jaegers or rather Jäger). I just received the book today - it is really great and even surpasses my high expectations. Beautiful, very atmospheric pictures, wonderful! Have to restrain myself from browsing too much because I first have to see the movie, of course. Great review again, Parka - keep up the good work! All. There are only 5. I don't know Evangelion, but Pacific Rim reminds strongly of an animated series I used to watch as a kid called "Attack of the Super Monster" (also known as "Aizenborg", or "Izenborg"). The plot and many elements are quite the same.